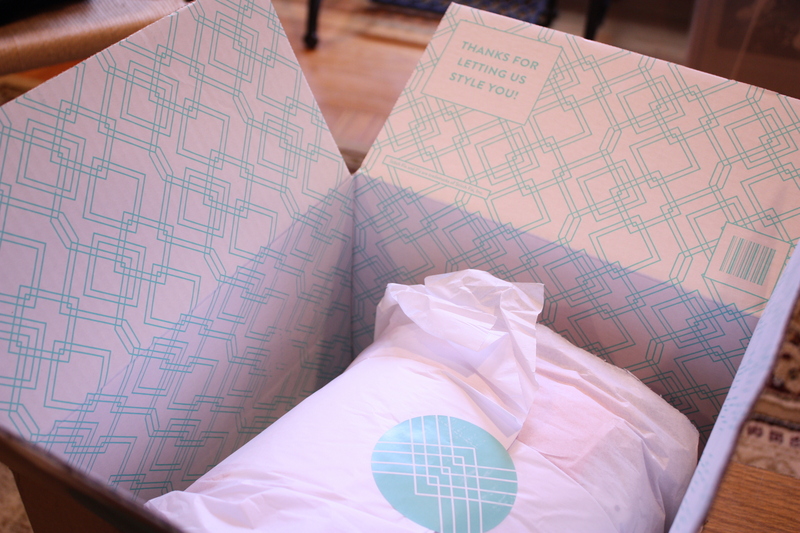 Stitch Fix (“SF”) is a part of the trend of boxed subscriptions available to women currently. As a member, you can opt to subscribe regularly (quarterly, bimonthly, monthly, etc.) or select dates whenever you’d like to update your wardrobe. The prime focus of SF is not to create outfits in every box for you, but to enhance your closet with fun, new pieces that may go things you already own. 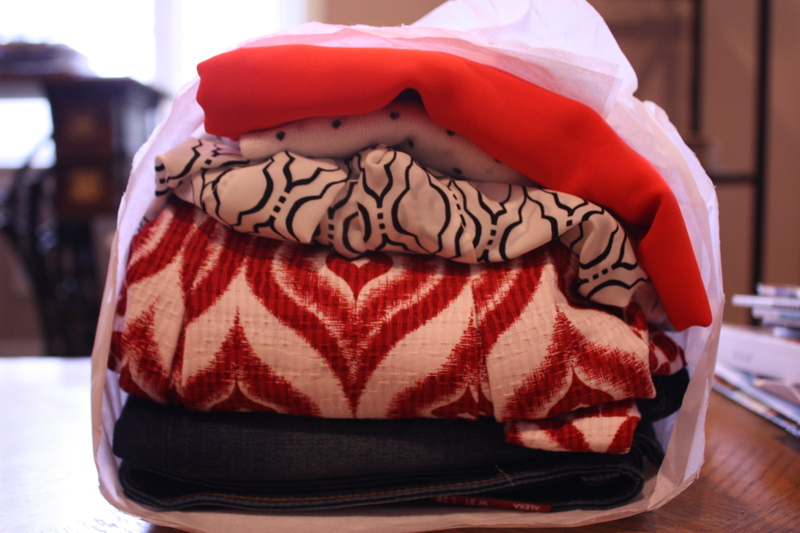 Every shipment comes with a note from your stylist, as well as recommendations on how to wear each piece. Register with Stitch Fix and complete a style survey based on your sizes/measurements/likes/dislikes/current lifestyle/etc. Pay a $20 styling fee for a stylist to review your survey, blogs, Pinterest boards, etc. The stylist chooses five items and sends them to you directly. Try on all of the pieces: keep what you want, send back what you don’t in a prepaid shipping envelope. If you buy any one to four items from your Fix, then SF will take off from the total the $20 styling fee they charged you originally. And if you decide to keep all fives pieces, then they take off the $20 fee AND an additional 25% off the total price, which is simply awesome. I’ve been using this service for close to a year now. I’ll admit that, in the past, I’ve been so frustrated with what Stitch Fix has sent me that I’ve thrown it all in the return bag and vowed never to return. Then I see a great dress or blouse that they post on Instagram and I’m hooked. What can I say, I’m an optimist when it comes to lovely surprises! This is my seventh Fix and it has been the absolute best thusfar. While SF says on their website that you get your own personal stylist when using their company, I’ve found that my stylists have changed with almost every Fix I’ve received, so there’s no dedicated person for me (yet?). This may be my best shipment simply because I’ve had the same person, Alessandra, a second time! Here we go! I always love opening the box and finding everything so neatly assembled! I loved the fun, quirky nature of this piece! The colors and patterns are so, so, so sassy. The material is thick and THERE ARE POCKETS! I was so tempted to keep this dress, but the steep price tag was hard to swallow admittedly. I have a slew of great dresses, a number of them recently acquired. I simply couldn’t justify keeping this one on this day (especially after renewing some theatre/philharmonic subscriptions this week and our mortgage payment due!). I’m already regretting my decision a tiny bit, but c’est la vie. Sent back. When I took this blouse out of the box, I had mixed feelings. 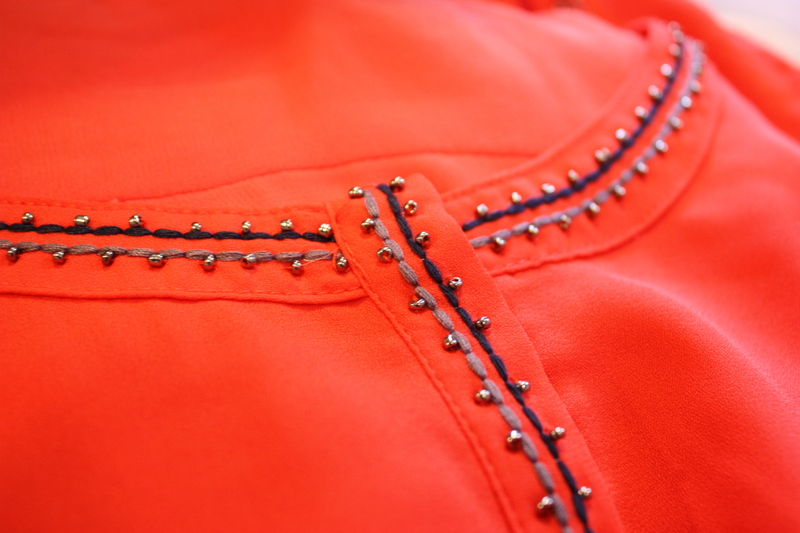 I loved the beading detail at the top, but the color was so bright and far from my natural inclination. Then I tried it on and I fell hard for it. 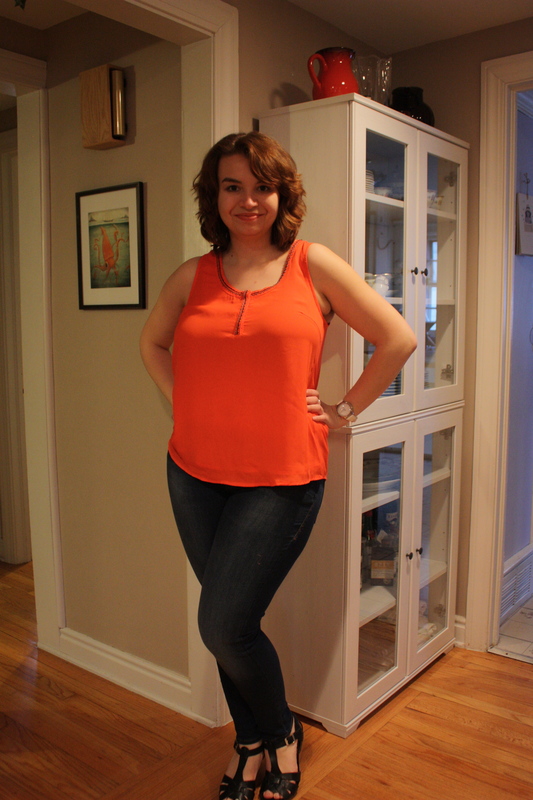 The photos sadly don’t do justice to the awesome pinky/orange color of this blouse. It’s so fiery and summery that I had to keep it. I think it looks great with jeans, but will play well with slacks too. As for the jeans: I felt like I was poured into them they fit so well. 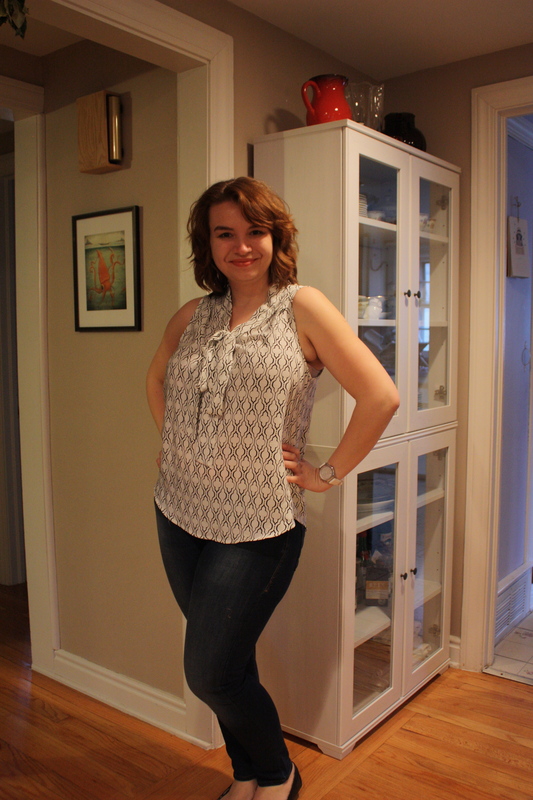 The fabric was lovely and soft and I knew that there would be plenty of consistent stretch after multiple wears (as opposed to those jeans that stretch out after two hours). Unfortunately I was experimenting with automatic photos on a grey, rainy, dusky night so the lighting is off enough to not show these pants well. They appear black here but were really dark denim — except for major fading on the thighs. The photo above does not hide the fact that I have some substantial curves going on and I really didn’t like the jeans keying in on that either. Blouse: kept. Jeans: sent back. 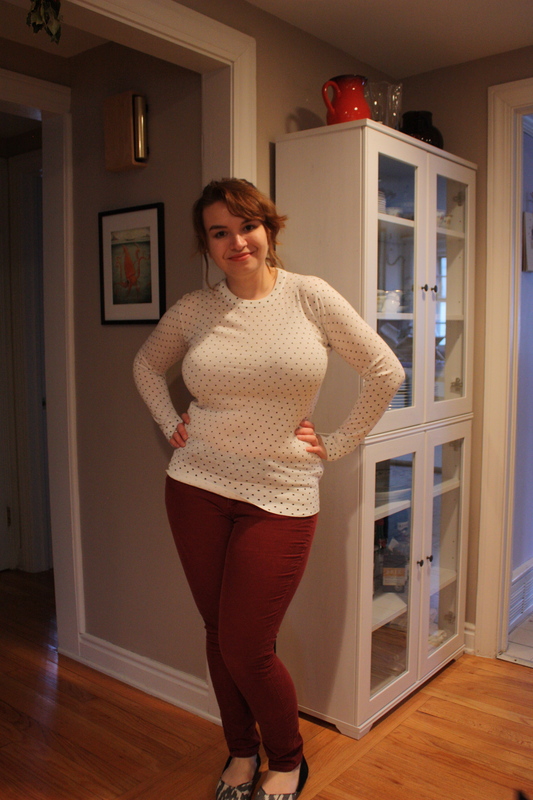 This was a cute polka dotted sweater. But it was a touch too small (I’m clearly not doing a great job of holding in my belly), a bit too sheer, and I have a bolder, thicker, similar top from the Loft last season. Sent back. I really liked the quirky pattern of this retro-style blouse: with a lot of crazy chevrons and giant florals gracing shirts like these, I was surprised by this spade/ironwork design. The blouse is a little boxier than I would have liked, but it’s a simple thing to fix by sending it through the sewing machine. While I’m wearing it with the Mavi jeans here, I have a pair of red slacks or yellow jeans I think this would look great with! Kept. All in all, I kept two pieces for a grand total of $92 (that’s after the $20 stylist fee taken off the top). While I loved that dress, I couldn’t swing it, but I’m certainly always in want of some nicer, dressier tops for work. You can sign up for this service here. Thanks for posting prices. I wish more bloggers did. I’m surprised how much that dress is, but it kind of answers my question – I’ve pinned tons of cute dresses, but never get them, and I wondered if it was because I have “the cheaper the better” selected. Starting to think that’s the reason. I’ve developed a system of hunting down some SF dresses elsewhere based on bloggers photos and reviews: both brand names and price points help in that endeavor, so I thought it best to include those details for others! I didn’t note this in my post, but most of my SF profile is set to “the cheaper the better,” except dresses, which I have at “$50-$100.” Since upping it to that level, this is the second dress I’ve received that was well above the $100 range. I couldn’t find a link to your Pinterest boards in your blog, but I’d be interested to see what you have your eye on. I’m curious to see if I know of any pieces being sold elsewhere for cheaper, information I’d gladly pass onto you if I could. The link to my Pinterest board is available when you click on the word Pinterest in my description of SF. Sorry I missed the link! I took a peek and only saw a couple that I recognized. There’s a black and white polka dotted dress: it’s from Leota and, because of the neckline, it’s what they call their “sweetheart’ design. I haven’t found that pattern yet, but they do have others available. I think the last place I saw it was on Zulilly for ~$50. 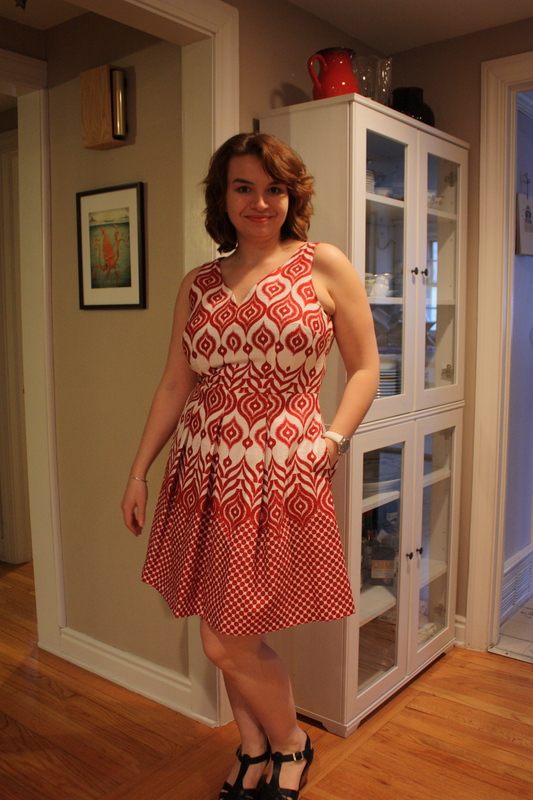 I’ll also say this: I received this dress from SF in March and, while the cut was great, the material was swimsuit-like. Also the pattern they sent was weird and overly geometric. You also posted a Maggy London dress — it has sheer stripes and you mentioned it being bubblegum pink. That same dress is on the TJ Maxx website in pink and white for $40 (while Belk has it for $148 and Zappos for $128). I just bought it in white from TJM and it’s LOVELY! It drapes so nicely and fits perfectly (for what it’s worth, I’m a 12 and I think you’re a petite). Wow, thanks a lot for the information!